Third grade marks a turning point in a child’s education, where he or she goes from learning to read to learning through reading. Research shows that children who fall behind in the earliest stages of reading are at heightened risk for chronic absence, failing to graduate high school, and a myriad of other undesirable life outcomes. Furthermore, children from low-income families are even more at risk of struggling to meet grade-level proficiency standards. According to the U.S. Department of Education, 82 percent of students from low-income families failed to reach the “proficient” level in reading on the National Assessment of Educational Progress (NAEP) in 2011. If current trends hold true, 6.6 million children from low-income families in the birth to age 8 group are at increased risk of failing to graduate from high school on time because they won’t be able to meet NAEP’s proficient reading level by the end of third grade. We know that if all students receive an excellent education via high-quality interactions with adults and educators, then children from all neighborhoods and backgrounds will be better prepared for success. We also know that if communities provide support to children and their families–ensuring access to the tools and resources necessary to become great readers—then all students will be more likely to succeed in high school, college, and in their careers. You can help turn the troubling statistics around by becoming informed advocates, supporters, tutors, and educators on childhood literacy. Here are 5 factors contributing to third grade reading proficiency. Preschool attendance is among the strongest factors of elementary school preparedness. Children who attend preschool arrive in kindergarten feeling more prepared to learn and are more comfortable with the classroom setting. As kindergarten becomes more academic and the standards rise, children are expected to enter kindergarten with some basic academic skills. In preschool children learn fundamental pre-literacy and pre-math skills such as counting and reciting the alphabet. Preschoolers also practice communication skills with other students and adults, enabling children to become more socially prepared for the classroom environment. A report by Johns Hopkins University researchers suggests that the national rate of chronic absenteeism is 10 to 15 percent, meaning that 5 million to 7.5 million U.S. students miss at least 10 percent of their school days every year. As common sense would suggest and studies have confirmed, chronic absence has negative effects on academic performance, especially among students from low-income families. The authors of Early Warning note that many children from low-income families fall behind in their reading proficiency by as much as two months during the summer, while their wealthier peers make slight gains. The achievement gap produced by summer learning loss grows over the years until it is nearly insurmountable. These trends provide evidence that summer reading programs can counteract such trends—narrowing achievement gaps throughout summer breaks. 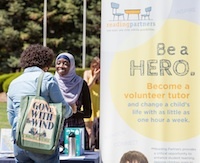 Reading Partners began piloting a summer tutoring program this past year in New York and Colorado. Research by Clancy Blair of New York University and the ECLS-B survey draws parallels between family stressors brought about from the stress of poverty and impaired learning ability. Children whose families experience negative or hostile economic, social, emotional, and community relationships are at an increased risk of impaired learning. Research shows that enriched learning environments and parent engagement at home are critically important to a child’s academic success. A five-year study of more than 1,850 children and their mothers found that children whose learning environments were of consistently low quality, with few enriched learning opportunities, were much more likely to have language and literacy delays before kindergarten. Undoubtedly, at-home instruction is only part of the solution to help children increase their capacity for reading and learning. 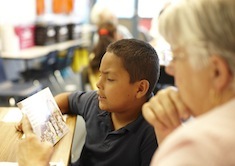 Classroom engagement focused on improving children’s literacy skills also remains at the forefront of the issue. Organizations and institutions such as, U.S. Department of Education, the American Federation of Teachers, strive to boost effectiveness of teaching strategies in the classroom. Furthermore, community engagement and advocacy around the topic of literacy provides the ongoing educational support and awareness necessary to ensure that students’ literacy needs are met. The current state of low reading proficiency among children from low-income families is not a chronic condition without a solution. Every child, with the proper support and attention, can become a strong, confident reader. Each of us has a role to play in helping narrow the reading proficiency gap—in our homes and out in the community. We all have the power to change the life trajectory of a child by giving the gift of literacy–unlocking opportunity.